Many of you were surprised when a commercially-zoned parcel across the street from Maho Bay sold late last year and plans for a new tiki bar and food truck were announced. Well there’s a second commercially-zoned parcel up for sale adjacent to that property, and it just had a significant price drop. It’s a 4.5-acre parcel that’s zoned for commercial development. This parcel, unlike the recently sold parcel where Maho Crossroads now sits, is large enough for a subdivision or small hotel. The current asking price for this parcel is $7.5 million. So should we all chip in and buy this and donate it to the National Park? What would you all like to see happen here? Let us know your thoughts in the comments section or over on our Facebook page. You should get a group together to buy and donate it. We should try, I wonder if the Trust for Public Land would be interested again as they engineered the donation of Maho into the park. Also, I noticed on the Maho Crossroads website their “Letter to the Community” where it states that they “are committed to limiting the development of the property to maintain the special love that we all have for Maho”. I would ask them to voluntarily change the zoning to allow the current use but restrict further developement. This would allay the suspicion many have that their current operation is a placeholder for larger future development. Leave it natural! Which probably means let it become part of the National Park. The “Beauty” of St. John is that it is NOT commercially or residentially over built, except that monstrosity just as you look up the hill from the dock (can’t remember the name but it took So Much away!). I would hope that whoever buys it would donate it back! I think you’re referring to Sirenusa. Over the years it seems to have blended into the hillside a bit. But it’s still the wrong scale and character for the island. The same could be said for Grande Bay. Architecturally impressive but misplaced. The connection between this 4.5 acre parcel to the 1.6 acre Maho Crossroads is that it is owned by the same family that sold the land to Maho Crossroads. I think it is time that the NPS acquired this land. Should have done so years ago. Sad that they were unable to do so. Maho has, is and always will be our favorite. We just left that area and Maho Crossroads are fine, comfortable, quite, and calming. But enough the rest should go to the park. Not to say that others shouldn’t make a living but, enough of that at Maho. There simply needs to be more nature than business. I am hoping that Cinnamon Bay gets some attention. That was so sad to see, alot made me smile. Keep St John simple! Let’s all go in together and buy it and donate it to the National Park. $7.5 million divided by $100 per person is 75,000 people. I could go higher maybe $500 that’s 15,000 people. Now we’re talking that is doable. Jen- start a movement I am in for $500 we just need 14,999 more people! I know $500 sounds cheap but man I am trying hard to retire before I am too old to come back! I agree with “Laura”! Let’s all chip in- we can do it! All the beauty of STJ is the park and people…. it’s our duty to save it! Oh no. How horrible that they would even think of putting a hotel there. Crossroads is a marvelous place and really made our trip. I loved the fact that the structures were not permanent and the eclectic decorations. Great place to have a St John beer! Purchase and turn it into a Donkey Sanctuary!! Oriel, YOU have the best idea. I hope you have been able to return to caring for your precious donkeys. I am so thankful for what you have done for them in the past and hope you can continue to do so in the future. They also mean SO much to me! I would definitely chip in to buy the land and then donate it to the park. 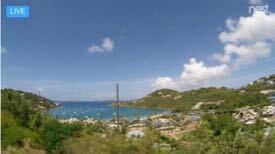 I was / am not happy with the “Maho Crossroads” business on the land across from Maho Bay. Even though it blends in with the area around it, and is only minimally developed, it still is a commercial enterprise and draws new traffic to the area. St John is so unique because of it’s National Park, with it’s undeveloped land, and lack of businesses and commercial establishments. This fact is why there are few people and very little traffic. Let’s keep St John QUIET, by leaving the land undeveloped, natural! I don’t have much $ but would contribute to a gofundme to get the land and donate it to the park.